Each gelatin capsule contains 500 mg of L-Ornithine, guaranteed pure and potent by the Self Health Resource Center. No binders, no coatings and no dye. Suggested Use: Persons 12 or more years of age, take up to 8 capsules before bedtime or as directed by a health professional. Start with 1 to 3 capsules and then take more as needed. 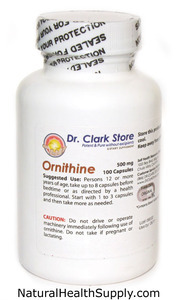 Caution: Do not drive or operate machinery immediately following the use of Ornithine. Do not take if pregnant or lactating. Store in a cool dry place. Keep away from children.